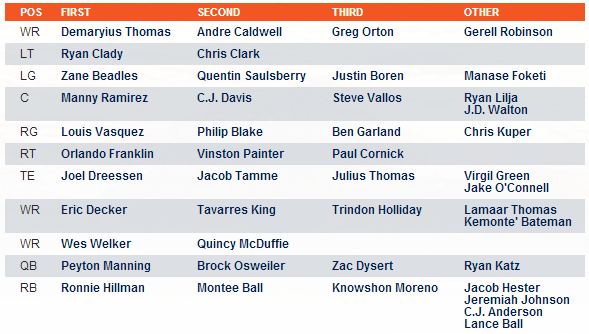 The Denver Broncos released their first depth chart of 2013 on Sunday afternoon. In the backfield, second-year running back Ronnie Hillman is listed as the starter. 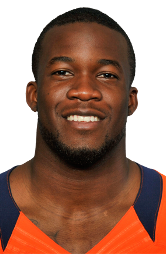 Hillman beat out rookie Montee Ball (listed as No. 2) and veteran Knowshon Moreno (listed as No. 3). In the team's scrimmage at Sports Authority Field at Mile High on Saturday evening, Hillman and Ball ran with the first-team offense. The Broncos will travel to take on the San Francisco 49ers in their first preseason game of 2013 on Thursday ($10 tickets here) and Hillman will be running with the first-team offense. 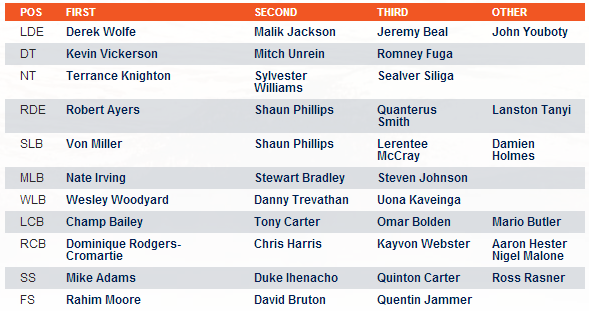 Apart of Hillman jumping both Moreno and Ball, there are few other surprises on the first offensive depth chart. Veteran center Ryan Lilja, who signed with the team on Wednesday, is listed as the fourth center, but that will likely change by the time Week 1 rolls around. View the complete depth chart after the jump. On the defensive side of the ball, there are a few more surprises. Mike Adams is currently listed as the strong safety (Duke Ihnenacho started over him on Saturday) and Nate Irving is the starting middle linebacker. At cornerback, Dominique Rodgers-Cromartie, who is recovering from a high ankle injury, is starting across from Champ Bailey, with Chris Harris Jr. the No. 3 corner. As for the specialist, kicker Matt Prater and punter Britton Colquitt have their jobs securely locked up with Aaron Brewer returning to snap and Trindon Holliday ready to handle all of the returning duties. Interestingly, the team has Wes Welker listed as the second punt returner and undrafted rookie Quincy McDuffie as the second kick returner. The fact that McDuffie has apparently impressed as a returner will help his chances of making the team. If he has a strong preseason, McDuffie may surprise and make the final 53-man roster, although he remains a long shot.